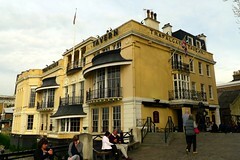 An imposing historic pub alongside the river in Greenwich. The views and location of this pub can't really be faulted. It sits just alongside the Old Royal Naval College, very near to [Greenwich Park]?, at the edge of the UNESCO World Heritage site of Maritime Greenwich. Views over the river are available from seats opposite the bar all along the ground floor level, and are particularly good from the upstairs function room photo with its large bay windows photo. The Victorian interior is all dark burnished wood, with wooden floors and tables, generally kept quite dim and atmospheric in the evenings (though there's plenty of light by day) photo. Part of the ground floor is kept laid out for dining towards the rear, but there are still plenty of tables opposite the bar and near the entrance. It gets a lot of tourist traffic during the weekends, but Ewan has always been able to find plenty of space to sit when visiting on weekday evenings. The bar has about four handpulls for ale, with Sharp's Own amongst them, and decently kept, as well as a range of draught beers and ciders beyond the basic lagers. Prices are on the high side, but not unreasonable for the area. There's an upstairs bar and bar area serving the bookable function room, with one handpull photo. Food is served noon-10pm Mondays to Saturdays, and noon-4pm on Sundays. There is a separate menu for the bar and the dining room, with the latter commanding higher prices and with more adventurous dishes. Some of the choices reach for rather flowery gastronomic language, but the dishes themselves are very sound. The fried whitebait (a local speciality, £7) were excellent for starting, while Ewan very much enjoyed a lamb dish for his main. There's a good wine list to accompany, as well. Last visited by Ewan and Kerry, June 2011. Opening hours and food times taken from website, March 2011. Last edited 2013-05-10 08:10:50 (version 5; diff). List all versions. Page last edited 2013-05-10 08:10:50 (version 5).